In order to clear any confusion, limequats are the larger more yellow fruits. For the sake of comparison they are shown next to the smaller orange kumquats. 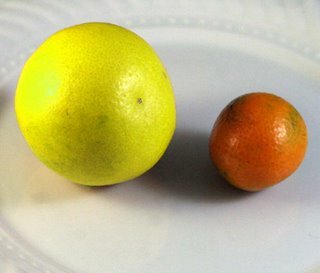 Limequats are in fact a cross between a lime and a kumquat. A box of them arrived the other day from our Houston friends Robbie Franklin and Labeth Lammers. Having always considered the limequat tree growing in their front yard to be ornamental, they were interested in our culinary take. Mix ingredients in cocktail shaker, shake well, and pour. 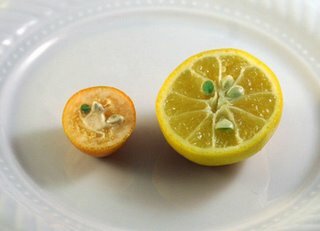 Limequats are grown commercially in many tropical countries and within the sunbelt of the United States. From a culinary standpoint, they are obscure enough to have been overlooked by all of the cookbooks in our library, including Elizbeth Schneider's classic Uncommon Fruits & Vegetables: A Commonsense Guide. The tart juice should be an excellent substitute where "Seville orange" juice or "bitter orange" juice are called for in hundreds of tropical recipes. Limequat rinds are sweeter, quite similar in taste to the rinds of kumquats, but with an aftertaste more suggestive of lime. The Franklins were kind enough to send enough limequats that we had them around for several days. Kept unrefrigerated, they tended to shrink as a ripening process progressed. The more ripe they became, the sweeter the juice. After four days, I found it difficult to differentiate the taste and flavor of their juice from a mixture of three parts orange juice with one part lemon juice.